If you have a golfer in your life you need never be stuck for great gift ideas, no matter what the occasion. No more boring socks, ties or aftershave. The game of golf has advanced tremendously and so has the range of awesome gear, gadgets, and accessories that go with it. You can have your pick not just from novelty items, but also from some very nifty and useful technical gadgets. To help you, we’ve compiled a list of the best golf gifts for any golf lover (in no particular order). A new golf GPS watch is the perfect gift for your golfing friend who also loves having the latest tech gadgets. It combines the power of golf GPS system, with the convenience and functionality of a watch. Any golfer will love having, and showing off this handy gadget to their friends. The Garmin Approach S1 is an older model, but still one of the best entry-level GPS watches. It is preloaded with more than 14000 U.S. and Canada courses and more can be added. The watch is available in black or white, includes an odometer, alarm and sets the time and time zone automatically using the GPS functionality. It’s packed full of features that will seriously impress and excite anyone unwrapping it. It provides yardages to the back, middle and front of the green, measures exact distances from anywhere on the course and tracks your distance using a pedometer when you are walking the course. It’s completely waterproof, has large numerals so you can read it at a glance and comes with a rechargeable lithium ion battery. It’s ready to use right out of the box with no setup needed and no monthly subscriptions to use it. If your friend doesn’t already have a golf GPS watch, then the Garmin S1 is a fantastic choice. 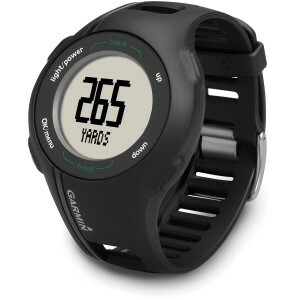 Buy the Garmin Approach S1 GPS Golf Watch here! –> See our list of the Best Golf GPS Watches here! Have a friend that’s a bit of a perfectionist? Always obsessing over the details? Then a new golf rangefinder could be the best golf gift for him (or her). It will them exact yardage to any target on the course, so they never have to complain about the yardage markers being off. The Bushnell Tour V3 is easily one of the best rangefinders on the market. Used by the pros, this makes a very special gift for any golfer and tops the list of as one the best golf gifts for 2014. All players with a rangefinder in their golf bag love them and never play without it. Those without one are eternally envious of those who do. It can be operated single handed and all you need to do is point it, press the button, wait for the jolt to confirm the laser found the target and read the distance off the display. Then it is all up to you to make the shot. It features Pin Seeker Technology to find the exact distance to the flag without being interfered with by other objects in the background. It is completely legal for tournament play and for posting scores for handicap purposes. It’s also ergonomically designed and has a sturdy and durable rubber casing that makes it very easy to grip. It comes in a handy carry case and a 3-volt battery and 2 year warranty is included. 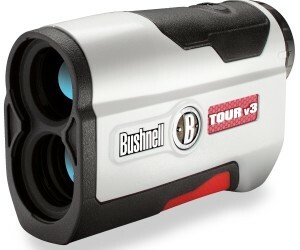 Buy the Bushnell Tour V3 Golf Laser Rangefinder here! –> See our list of the other best golf rangefinders here! Smartphones can do nearly anything these days. If you know a golf lover who has a newer iPhone or Android device, then you should definitely consider getting them one of these cool swing analyzer devices. Every golfer wants to improve their swing and they are always looking for ways to do it simply and without spending thousands on lessons. The Zepp Golf 3D Training System allows you to practice your swing and get immediate feedback and analysis on a range of factors affecting your swing. 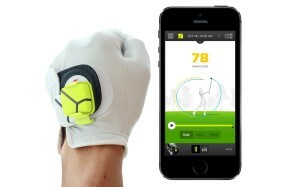 It simply clips onto your glove, syncs with the app on your smartphone (iPhone and Android) and gives you instant feedback swing after swing. You also have the ability to see your swing in 3D animated model, so you can analyze it from every angle. Or you can compare your swing to professional players and coaches. With the data provided you can implement corrections and tips on your next swing and start making progress immediately. Apart from having a coach right there with you, there is no better way for a golfer to improve their swing on the spot. This best golf gift for 2014 item is a must for any avid golfer out there. 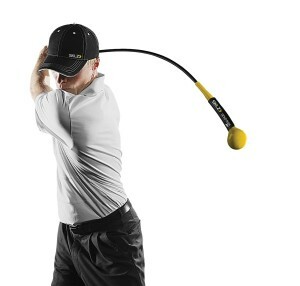 Buy the Zepp Golf 3D Training System here! –> See the rest of the best golf swing analyzers here! Putting mats are the best golf gifts for winter! Any golf lover would appreciate a great putting mat to keep their short game in shape during the off-season. Improving their putting accuracy is on every golfer’s mind. 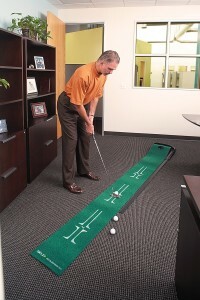 A putting mat like this one from SKLZ allows them to practice at home, at the office and during the long winter months when they can’t get out on the course. With this gift the golfer in your life can quickly nip out to the garage to practice or get in a few practice shots between meetings. It’s a great quality item and will provide years of service. Buy the SKLZ Accelerator Pro Ball Return Putting Mat here! –> See the other best putting mats here! Golfers are always trying to improve their game. A good golf swing trainer tool can help them get the upperhand against their friends and the course. Core muscles are important for a golfer and directly affects their swing, accuracy and the distance they get. The Gold Flex allows you to not only warm up before a round, but will also give you a great core workout and help you improve your swing. It is very handy and fast to use at home for a quick workout and swing practice. Buy the SKLZ Gold Flex Tempo Trainer here! –> See the other best golf swing trainers here! Know a golfer who likes to travel? Then, we’re sure they would appreciate a great golf travel bag, so they can safely take their clubs with them. Business trips, family holidays or golfing weekends will be a breeze with the CaddyDaddy. We cannot imagine that any golfer would not be ecstatic receiving this as a gift. It is always a struggle to cart your clubs through the airport and multiple transfer can be irksome with a sub-par golf travel bag. The CaddyDaddy Constrictor 2 is one of the top options out there, and won’t break the bank. This best golf gift 2014 should top the list for the travelling golfer in your life. Buy the CaddyDaddy Constrictor 2 Travel Golf Cover here! Even golfers have a sense of humor! Any man with a sense of humor will appreciate this graphically shaped golf ball holder. The “MySack” appropriately holds exactly two golf balls, has a velcro close top, and can easily be attached to your golf bag. This gift will guarantee some laughs, and is also quite useful! 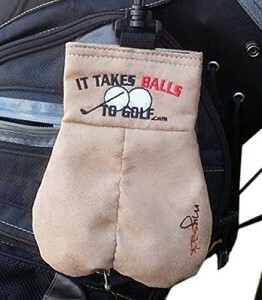 Buy the MySack Golf Ball Storage Sack here! Serious golfers will go through a few golf gloves each season, and are always in need of a replacement or backup glove. It makes a great gift, and is also easy on your wallet ($10-$30). Just make sure you know their size! This glove from Nike looks great, fits well, uses excellent quality material and is extra durable. There is also Lycra spandex material placed on the fingers and back of hand for maximum flexibility and breathability. The Dura Feel VII is not the most high-end glove on the market, but for only around $10, you can’t find a much better deal. It is available in white, or black. 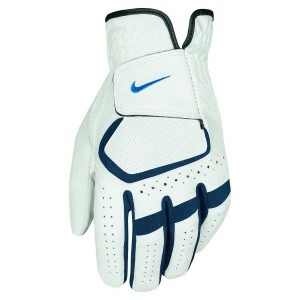 Buy the Nike Dura Feel VII Golf Glove here! –> See our list of the other best golf gloves here! Golf is a 99% mental game. A great golf book will be an interesting read, and could help improve your friend’s game as well! Whether the golfer in your life is a seasoned player or a mere beginner, this timeless and completely illustrated guide will be used time and again. We guarantee it will never be too far out of reach and will get ample use over time. 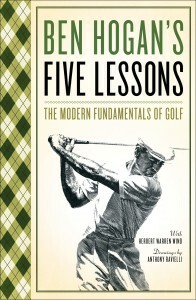 Ben Hogan’s reveals his special techniques that will help any average golfer improve their scores. Every golf lover should have this classic on their bookshelf! –> See more great golf books here! 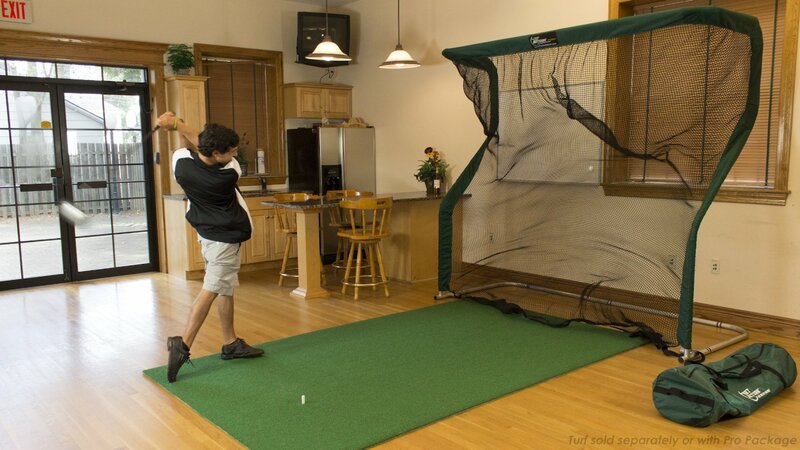 A golf net (coupled with a golf hitting mat) is one of the best golf gifts for anyone stuck at home during the long winter months, or for someone who just doesn’t have time to go to the range consistently. Golfers can never get enough practice! If price is no issue, then the Net Return Pro Series Golf Net is easily the #1 golf net available todayt. It is simple to assemble, can be used indoors or outdoors, and is made of the highest end material on the market. The net 7′ 6″ high, 8′ wide and 3′ 6″ deep, so make sure there is somewhere in the house to put it. The only downside of this net, is that it costs $495. Buy the Net Return Pro Series Golf Net here! –> For some cheaper options, see our list of the best golf nets here! There are two items that golfers are always looking at: irons, and drivers (#12). These are probably the best looking set of irons on the market today. Some have even called the beautiful. They definitely are eye catching. But it doesn’t stop there. Their performance is unsurpassed and many say that Titleist has done the impossible; improved on a range that couldn’t possibly get any better. Their predecessors were the best sellers in 2013 with very good reason. The price tag may be a bit on the high side; however, if you are looking for that something extra special for a big occasion, it will be the best money you’ve spent in a long time. 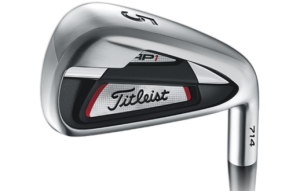 Buy the Titleist 714AP1 Iron Set here! Probably the #1 thing on most golfers’ list is a brand new driver. 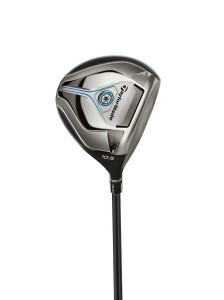 If you’ve heard some hints around the house that someone needs a new driver for his bag, you cannot go wrong with the TaylorMade JetSpeed. This club will generate faster swing speed and increase distance and confidence. Users report it’s a vast improvement over TaylorMade’s previous driver, the RBZ. No wonder GolfDigest gave it the gold in its 2014 hotlist roundup. In this category it is definitely the best golf gift of 2014. You’ll be proudly credited when asked where he got that amazing new driver from. And his friends will be asking. Buy the TaylorMade JetSpeed Golf Driver here! Whatever item peaks your interest on our best golf gifts list, the golfer in your life is sure to love it. Make your choice today! What’s the Best Golf GPS Device? What is the Best Divot Repair Tool? Choosing the Best Golf GPS Watch What are the Best Golf Hats? ‹ What is the Best Golf Carry Bag? Amazing post these golf gifts are great for an avid golfer like myself. 1 Pings/Trackbacks for "The 12 Best Golf Gifts for Golf Lovers"